My sister asked me to check out a panel at New York Comic-Con for her new favorite show, SyFy’s Wynonna Earp, which debuted in the Spring. 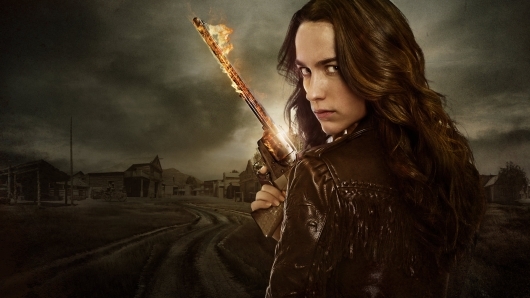 From writer and producer Emily Andras (Lost Girl), Wynonna Earp‘s title character is the famed Wyatt’s great granddaughter and she’s slaying demons and other creatures Wild West style. The panel featured Andras; Wynonna herself, Melanie Scrofano (Damien); costar Tim Rozon, who plays Doc Holliday; and creator and comic writer Beau Smith. The panel session opened with a blooper reel from the first season, which had the crowd and panel guests hysterical. The moderator asked what was up with the upcoming second season and Andras responded by saying we’d see the stakes get higher, the hearts get broken, and the moustaches get thicker. Beau Smith was asked about his favorite scene from the first season. He said it was Wynonna and her sister Waverly (Dominique Provost-Chalkley) sitting around the campfire while Doc fixed the mailbox. Tim Rozon laughed because he wasn’t even on set for that, but rather filmed it later and was added in post production.